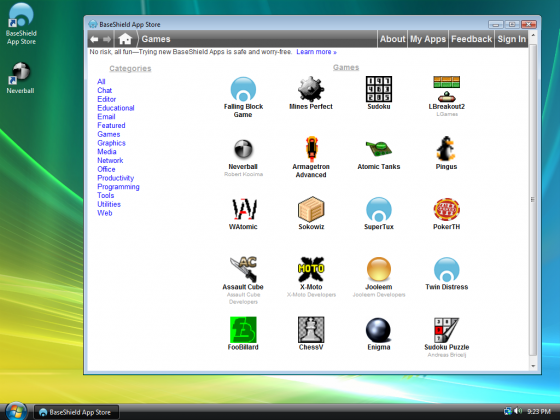 Swieskowski and his co-founder Sascha Kuzins, both serious open-source hackers, had a better idea: a download app store for Windows PCs that could distribute any third-party software, just like the iTunes App Store does for the iPhone. So they created the BaseShield App Store, which launched about an hour ago. Once you download the BaseShield App Store to your Windows PC (no Mac or Linux versions), you can download and launch an app with a single click. The apps run on a virtualization layer on top of the OS, so there is less chance for malware to infect the rest of your PC. Each app can also be removed with a single click. 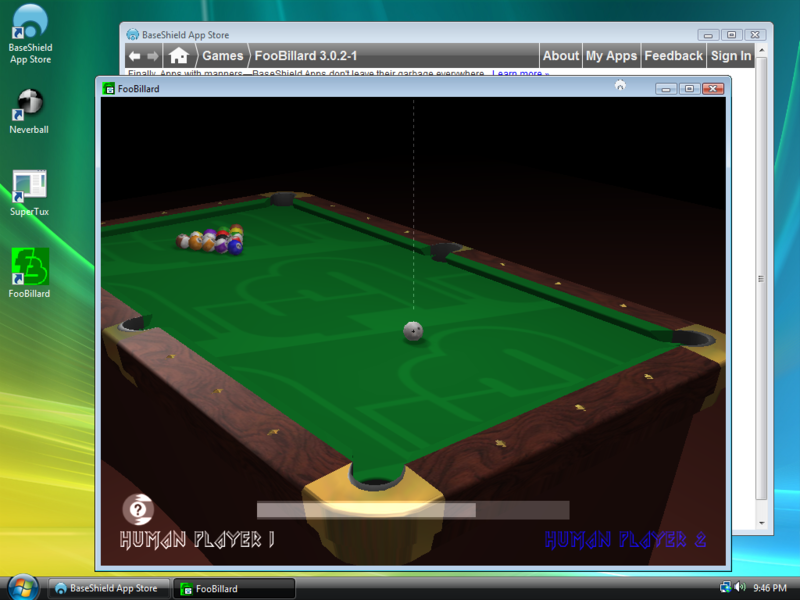 The apps can take advantage of the full power of the PC, including 3D graphics chips, but BaseShield creates a sandbox for each one so that they can only access the files necessary to run the program. BaseShield is not much more than a technology proof of concept at this point. At launch, it offers about two dozen free, open-source apps, including Neverball (open-source version of Super Monkey Ball), Inkscape (open-source version of Adobe Illustrator), AbiWord (word processor), Celestia (“like Google Earth for the universe”), and Frets On Fire (Guitar Hero clone). Developers who want to get their software in the store fill out a form and provide a link to their software, and BaseShield does the rest. While the technology is intriguing, the company still hasn’t settled on its business model. But it will likely be similar to the iTunes App Store, where BaseShield takes a percentage of every app sold.